Like all international destinations and cultures, Paris has its own subtle distinctions when it comes to bathrooms. This overview of local attributes and definitions will help newcomers feel at home. 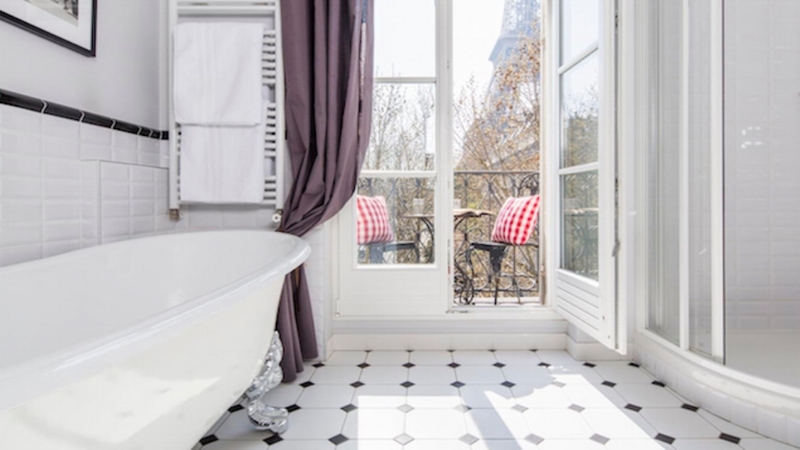 What is defined as a bathroom in Paris? According to Wikipedia, in North American English a "Bathroom is "commonly used as a euphemism for a room containing a toilet or possibly a public toilet (which, in the USA, is more commonly called a "restroom"). However, in France and many other parts of the world, a "bathroom" is used to describe a room that doesn't necessarily contain a toilet. Contains a shower and a tub that is adjoining to a master bedroom Typically contains a shower, basin and toiiet. May also include a tub in larger apartments. Contains four plumbing fixtures: Bathtub, shower, toilet, and sink. Bathtub, shower, and sink. Toilet is either included in the bathroom or in an adjacent room. Typcially just referred to as a "Bathroom" if there are no ensuite bathrooms in the house. A full bathroom in a house where one or more bedrooms have en-suites. Toilet (Aus) Contains just a toilet and sink In Aust, NZ and other Commonwealth Counties it's common for a bathroom to not contain a lavatory; but with a separate 'toilet' next door (a very small room with only a toilet and perhaps a tiny hand washbasin). Contains toilet, sink, and shower. In some U.S. markets, a toilet, sink, and shower are considered a "full bath". This would still be referred to as a "Bathroom" in Australia. Like hotel rooms, stairways and elevators in Europe, bathrooms are also generally smaller than you would expect. Why don't all bathrooms have toilets? 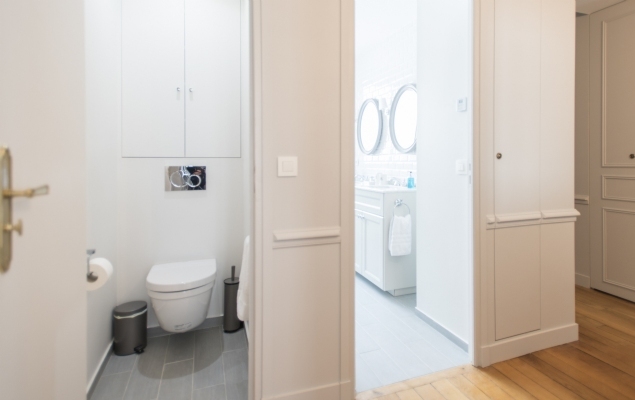 Unfortunately the French do not believe in putting toilets in main bathrooms and, although we do install them whenever we can, it is difficult because there is only one waste column in every building and all toilets must be located near to it. Many of our apartments are also heritage listed buildings with very strict building codes that make it impossible to add extra drain pipes, waste columns, etc. 2 Bathrooms (one with toilet) + separate WC. The first bathroom has a bathtub, shower, wide sink and toilet. The second bathroom features a large shower and sink (no toilet). There is a separate WC with toilet and sink located just off the hallway. Toilet, WC or Powder Room? In many countries, the terms "toilet", "WC", and "Powder Room" are used interchangeably. The WC refers to the initial letters of Water Closet and is widely used in France (pronounced "le vay-say" or "le vater"). It's typcially a toilet contained in a small room. Powder Room: in public this describes a room containing a toilet and washing facilities for women. In private, it's typically a toilet contained in a small room, usually with a hand wash basin.